We get to drink a lot of beer at Paste. It’s one of the perks of the job, but it’s also a lot of work. Every month, Paste headquarters hosts a massive blind beer tasting where we judge and rank dozens of some of the best beers in a given style to try to figure out which beer is the best. On top of that, we have countless single reviews to write, not to mention the smaller lists we put together outside of the big blind tastings. Add it all up, and it’s a lot of freaking beer. So much beer that we’re not even half way through the year and we’re feeling nostalgic about the best beers we’ve had since New Year’s. So, we’ve compiled a short list of the best beers we’ve had this year—the blind tasting winners and the beers that scored incredibly high reviews. We’ll update this list as we move through the year, but for now, we’ll start with the best 10 beers we’ve had in 2017. These aren’t ranked in any particular order (because how can you compare a barrel-aged imperial stout with a hefeweizen?). Instead, we’ve listed them in alphabetical order. 143. That’s how many bottles made it into our wild/sour beer tasting this summer. Is 143 wild/sour beers too many wild/sour beers? If you drink them all at once, sure, but if you space it out over days, and if at the end of those days you come to the agreement that this beer, a sour from an up and coming young brewery, is the very best of the lot, then no, it’s not too many wild/sour beers. It’s just the right amount. Black Project, out of Denver, specializes in “heady and spontaneously fermented wild ales,” and Peacemaker managed to stand out in the tasting, even with such stacked competition. It’s a blend of two beers, “both fermented from coolship-caught microbes,” before being aged in bourbon barrels that then were used to mature Colorado cherry wine. The result is the best of both worlds—a softened bourbon whiskey character with traces of the original caramel, vanilla and deeply toasted oaky notes, but with the addition of bright cherry and strawberry fruitiness. There’s elements of funk, which contribute some light barnyard characteristics and perhaps a touch of light peach fruitiness, but that’s the running theme of this beer—many, seemingly disparate elements that are all working together, with none coming to dominate the others. This is not some treacly, sweet, artificially fruity attempt at an American wild ale. It’s a sophisticated, complex beer that uses both complementary and contrasting notes to build layers of flavor. And it’s our #1 American sour/wild ale. Damn, that’s a lot of words. The Beatitude Boysenberry came across our path at the beginning of the year, as the latest in the brewery’s Beatitude Tart Saison series, which is over a dozen strong with a cornucopia of fruit and dry-hopped variants. The Boysenberry follows through with its robust name, delivering huge notes of the promised berry on the nose and sip. Those jammy flavors help cut through the sourness of this beer, which is plenty damn sour. Particularly on your first couple of sips. It’s bracing. But you also get vanilla and oak from the barrel, and that jam kicks in hard providing a sweetness and balance. In the end, our reviewer called it a “glass of tart berry jam” that was absolutely stunning. Remember when gose was the strange new kid on the block? Now it seems like everyone who’s anyone is brewing a gose. We tasted 64 of the best of them and ended up crowning this beauty from Creature Comforts, which our tasters decided was “the ultimate summer refresher.” It takes cucumber and makes it the star of the show, with a clean, incredibly refreshing cucumber note that shines through the beer from start to finish. At the same time, though, it never loses track of the other “gose” elements: There’s some pronounced coriander and a big twist of lemon-lime citrus, which provides just enough residual sweetness. Tartness is right in the middle—firm enough to be refreshing without getting excessive. For all intents and purposes it’s pretty much a classic gose until the cucumber element comes in and takes the beer to the next level. At this point in the state of craft beer, another new double IPA isn’t that big of a deal. New DIPAs hit the shelves seemingly every day. One just dropped in the time it took you to read that sentence. Wait. There’s another one. But when Firestone Walker introduces a new DIPA, shortly after discontinuing their beloved Double Jack IPA, we pay attention. 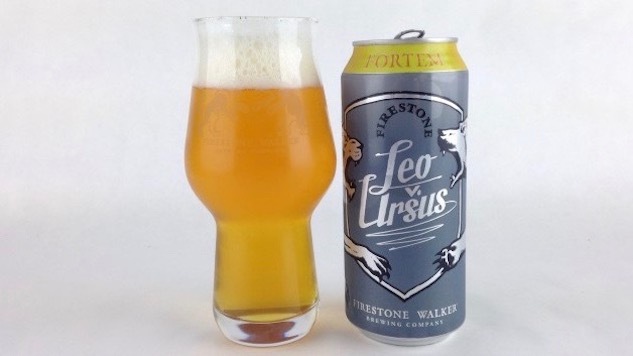 Fortem is the first beer in a new series dubbed “Leo v. Ursus,” and it will only be on the market for a few months at best. So, when they sent us Fortem, the first in a new Leo v. Ursus series of beers. It blends old and new hops from the Pacific Northwest and Germany with pale malt, wheat malt and flaked oats. The result is a creamy body that helps emphasize the aromatics, which are “big on citrus, with lots of lemon, grapefruit and orange,” according to our reviewer. The taste is maltier than you’d expect from the nose, approachably bitter with plenty of citrus fruit goodness without falling into the “sweet” IPA category. It’s also much easier to drink than its predecessor, Double Jack. Our writer went so far as to call it a “beach party DIPA.” That’s my kind of beach party. As we said, the competition for best barrel-aged imperial stout in our blind tasting, which had 144 entries, was fierce. So brewing the second best beer in that contest is quite the feat, and the win helps support our thought that Jackie O’s is one of the most underrated breweries in the country. Spirit Beast is a mixture of five different stouts, plus a quadruple, all blended before being aged in various barrels before being blended yet again. That’s a lot of work, and the result is a big pay off that our tasters called, “a revelation.” As you might expect from a beer with that much back story, it’s really complex, with all kinds of flavors (from cocoa to dark fruit to booze to wine) coming at you from all angles. If you get your hands on one, take your time with it. You won’t be sorry. We put together a blinding tasting of 59 of the best Wheat Beers and Hefeweizens—a style that can probably be credited with getting a large share of drinkers into craft beer in the first place. Raise your hand if the first beer you fell in love with was Blue Moon? Go ahead, don’t be ashamed. The style is robust these days, to say the least, with hoppy wheats and tart Berliner Weisse offerings and fruited wheats…It’s a broad field, so we narrowed the tasting down to just Americanpale wheats and German hefeweizens. Live Oak’s Hefeweizen took the honors. It makes sense, because Live Oak is located in Texas and, well, Texas is hot as hell. It’s a state that needs a light, effervescent beer. And Live Oak’s Hefeweizen is just that, with a very “authentically German” nose that seemed downright imported by out tasters. The taste was a wave of banana bread and light spice delivered on a wave of creamy malt backbone. Hell yeah. Summer. Even more impressive, this is the first blind tasting Live Oak has entered. Not bad for a rookie. Okay, the barrel aged imperial stout tasting was a traumatic event, but that’s not to belittle the effort the team put into tasting and ranking 102 of the best (non-barrel aged) imperial stouts. Just because they weren’t aged in oak, doesn’t mean they’re not formidable brews. The imperial stouts in the tasting were a kaleidoscope of flavors, from hoppy stouts to peanut butter stouts. In the end, a relative youngster of a brewery took the top spot. River North Brewery, out of Denver, knocked it out of the park with Mr. Sandman, a 13.5% that earned absolutely no negative remarks from tasters. That sort of consensus is unheard of in this sort of assembly. It’s a big, motor-oil sort of stout laden with dark fruit, sturdy roasted character and bittersweet chocolate. And don’t forget the booze. Cause it’s there too. We started the summer by tasting 52 of the best session IPAs you can find out there in the great wide world and the winner was from a brewery that was a newcomer to our blind tastings. We’ve been hearing a lot about Mississippi’s Southern Prohibition, and Devil’s Harvest proves the brewery is on to something. The brewery cheekily calls it a “breakfast IPA,” which might lead the unwary to expect a coffee-infused beer, but they’re more accurately referring to either the ABV (which is actually on the higher end as far as the style goes) or the juicy, citrusy hop profile. Either way, this stuff is delicious. Devil’s Harvest takes more than a few cues from NE-IPA brewing techniques. A “moderate dose of oats” enhances the creamy mouthfeel in a way we tend to associate with Maine Beer Co.’s IPAs, and that comparison isn’t too far off. Big waves of orangey citrus give way to lots of apricot-like stone fruit character that is particularly lovely. Bitterness is more or less nil—this beer is an aromatic powerhouse, but it leans entirely on texture rather than bitterness to keep it from coming off like fruit juice. To quote one score sheet, “This is effortless drinking.” To quote another that didn’t exactly mince words: “People will like this beer.” True enough. The Belgian Tripel is a bit of a niche style. It’s a high-gravity beer with strong, Belgian yeast character that has a long history, for sure, and has enjoyed its day in the sun here in the states, but these days, American breweries tend to take liberties with the style parameters, adding spice, barrel aging or fruit…But we decided to focus on the classic versions of the style, from storied Belgian breweries to new beers from American breweries that take a classic approach to the Tripel. The question then, was who would do the tripel best? Could a new tripel topple an old-school tripel? In the end, Belgium proved to do Belgian tripels best. Straffe Hendrik Bruges is a classic Belgian brewery, and their Tripel Bier was boozy like the other Belgian entries and had a hint of sherry that faded into “a plethora of fruit flavors of both banana and red fruit,” before disappearing with a dry finish. You’ve heard of this beer. You’ve probably even gone out of your to try to drink this beer. In the words of Ron Burgundy, it’s “kind of a big deal.” Darkness has been considered one of the best non-barrel-aged stouts in the country, so it was no surprise that it crept to the top of our blind tasting for non-barrel-aged imperial stouts. It’s burly, but balanced with a creamy mouthfeel that delivers prominent notes of cocoa and dark fruit and (our favorite?) booze. Seriously, it’s boozy. So much so that we thought Surly was sandbagging the ABV a bit. It’s one of those beers that rolls down your throat and begins warming your chest. One of those beers that turns beer geeks into fanboys. Yep. Belgium-based Westmalle bills it’s tripel as the “original tripel,” even though history might not support that claim—the tripel was supposedly invented by Hendrik Verlinden of the Drie Linden Brewery while he was helping the monks of Westmalle refine their own brewing techniques in the 1920s and 1930s. Regardless, Westmalle’s Tripel is bananas. It hits all of the classic hallmarks: “Spice, pronounced fruity esters, a bit of grassy hops and a creamy mouthfeel built on a foundation of bready, doughy malt,” according to results of our blind tasting. It was just barely edged out by Straffe Hendrik Bruges Tripel Bier for the top spot, but Westmalle has managed to do a rare thing: created a world-famous beer that actually exceeds its expectations.